O.K. so why are there no other sources for it on the interwebs? The only other source is from Feng Shui stating the right side is female, west and the white tiger, the left side is male, east and the green dragon. He cites this book Wu Dzing Pian as the source. O.K. I found a second source!! This movement will be familiar to all persons who practice T'ai Chi Ch'uan (Taijiquan). In Taijiquan, various names for this movement include: Moving Hands Like Clouds, Waving Hands Like Clouds, Playing with Clouds, Wave Hands in Clouds, Cloud Hands 云手 : Yun Shou. The Taijiquan the feet and hands move gracefully in a coordinated manner, while in Dragon Qigong the hands and waist move but both feet do not move. At first the movement sequence will seem a bit stiff and mechanical. After numerous practice sessions, this "Cloud Hands" movement will become more fluid, flexible, playful, and flowing. You will begin to become the White Dragon Playing in the Clouds. Repeat this movement sequence to the right side and left side for four to eight repetitions depending upon the time available and/or your level of physical conditioning. Don't hold the breath; breathe freely and easily in coordination with the movements. Take your time; move slowly and deliberately. I like to bend my knees and sink down a bit during parts of this movement - don't keep the knees stiff. Flow like a Dragon in the moving clouds. Be sure to turn at the waist. "In ancient Chinese culture, the dragon usually represents the yang or male forces of nature and the tiger the yin or female forces. Balancing those energies inside yourself is an essential part of this ancient self-healing system. In China, the words "dragon" and "tiger" appear in many branches of qigong and in various martial arts. Taoists brought Dragon and Tiger Qigong to China's Shaolin temple, where it was preserved intact by Chan Buddhists. This was the original form of qigong from which the usage of the words "dragon" and "tiger" entered into the world of martial arts and qigong. Dragon and Tiger Qigong was commonly taught only to the Shaolin high clergy and not to the general public or ordinary monks. For this reason, many people in China still refer to it as a form of Buddhist qigong. However, because Dragon and Tiger develops and integrates the internal energetic principles of neigong, it is deeply rooted in Taoist qigong." "The dragon and tiger are respectively the yang and yin components of generative energy. Other names for the dragon are: the yang dragon that hides with the fluid, the yin within the yang (symbolized by the broken line flanked by two solid lines in the trigram Li), the vapor within the fluid, the vapor of pure yang, and the true fire. Other names for the tiger are: the yin tiger that hides within the vapor, the yang within the yin (symbolized by the solid line flanked by two broken lines in the trigram Kan), the fluid within the vapor, the fluid of pure yin (or the vapor of pure yin), and the true water. The dragon and tiger are therefore the components or ingredients of mundane generative energy. Do not confuse them with their carriers, fluid and vapor. Central to the preservation and cultivation of generative energy is the process known as the copulation of the dragon and tiger. The yin and yang components of generative energy meet and merge to become purified generative energy, which is also called the primordial vapor. The process begins with the vapors of pure yang (dragon) and pure yin (tiger) rising from the base of the spine and traveling separately up the spine and through the shoulder blades. When the vapors reach the head, they interact (copulate) and merge to become one unified vapor. This unified vapor descents to the palate of the mouth and is manifested as nectar, a sweet, sticky fluid. Swallowed down the throat, the nectar enters the middle tan-t'ian (in the area of the solar plexus) and eventually completes its circuit when it reaches the base of the spine again." - Nourishing the Essence of Life: The Outer, Inner and Secret Teachings of Taoism. Translated with and Introduction by Eva Wong. Boston, Shambhala, 2004. Pages 9-10, 8-23,94. Translation of three texts from the Daoist Canon, circa 1400 CE, called The Mysteries of the Tao (Tao-hsuan p'ien), Understanding the Mysteries (Wu-shuan p'ien), and the Sacred Treatise on the Great Mystery (T'ai-hsuan pao-tien) of the Complete Reality School of Daoism. AND SO NOW - we get clarification. The male or positive vitality is the metal as the lung energy. And so the right hand is yin as lower body - that goes against the yang of the lung as yuan qi energy.... interesting!! fire derived from prenatal vitality is “negative fire” in the house of water…. “spirit in li” the house of fire (the heart) is essential nature. And so the Tiger is the Lung Metal Yuan Qi source of the generative fluid - so the fire within the water or yang sun within the moon. You can see HOW Complicated this is!! haha. When I search Bruce Frantzis book on Dragon and Tiger qigong for Lung - I get one hit that mentions dragon! O.K. so maybe he just doesn't get into all the complicated Taoist Alchemy secrets. haha. within this fire is the Yin Water. within this water is Yang Fire. the essence of the sun. the splendor of the moon. So here is the secret - the "yin" of the fire is the liver of the heart while the yang of the water is the lungs. So what the common saying of alchemy says to take from the water to feed the dragon as fire - that means a FULL cycle of the energy since it has to go through the pineal gland to get purified and returned back to the lower tan t'ien, now the dragon, instead of tiger. That is the secret of Dragon and tiger interchanging....as real alchemy. Hence when yang (fire) contains a yin essence, it is known as wood (lesser yang) and when yin (water) contains a yang essence, it is known as metal (lesser yin)….just as greater yang (fire) grows from lesser yang (wood), so must fire be retracted back into wood. Just as greater yin (water) grows from lesser yin (metal), so must water be retracted back into metal. The two retracted halves - wood and metal, lesser yang and lesser yin, are then able to form the perfect earthly balance. This retraction and unification of yin and yang provides the matrix in which the golden embryo grows or is cultivated. 'Taking from water (☵) to fill in fire (☲)’: The History and Dynamics of Daoist Alchemy by Aaron Cheak, Ph.D. So Aaron Cheak does know the real secret - but does he know that is also the secret of the Dragon and Tiger Tai Chi "moving hands like clouds" movement? The triagram Li is fire and predominantly yang, but the important middle line is yin, and so the Dragon is female. It is the yin essence in the yang, water in fire, the female in the male, the moon in the sun. It is referred to as Green Dragon....It is water that rises, being heated, and is therefore fiery but yielding, rising to Heaven. In the alchemical process, the yang in the water is used to settle the yin in the fire: the water rises and the fire descends. Thus the solid yang line is taken out of the Water to replace the middle yin line in the Fire, thus producing Heaven. “the male of kan [water] is the sun and the female of li [fire] is the moon." The Lungs also direct Qi downward. A full inhalation can only occur when the Lungs send Qi down to the Kidneys, which in turn “Grasp The Qi.” This is essentially “Dantian Breathing,” or “Kidney Breathing,” the deep abdominal breathing advocated in meditation, Nei Gong and the martial arts. For this reason, natural deep breathing is of paramount importance in the internal arts. Again the secret is the LUNG qi pulls down the FIRE of the heart (the liver qi) - since the lung qi is WATER.... Gotcha!! But Fowler and Ewers took down their book? it's not on google anymore. hmmm. Wonder what happened to this book? There we go - a real INternal Arts ALCHEMY lineage!! the Heart is considered to be the son of the Liver and the mother of the Spleen within traditional Chinese medicine the Heart is known as the emperor of all the internal organs (Zangfu). The Taiji Pole is a central line that runs from the crown of the head at the (Bai Hui) “Hundred Meetings Du 20” directly through the centre of the body to the (Hui Yin) “Meeting of Yin Ren 1” located between the legs. The Taiji Pole is made up of three major energy vessels the Governing Vessel (Du Mai) which travels up the length of the back through the spinal column where it connects to the Conception Vessel (Ren Mai) that travels down the front of the body. The third major vessels is the Thrusting Vessel ( Chong Mai) which does travel through the Taiji Pole. Each of these three major energy vessels store the vital energy (Qi) and circulate it throughout the entire body through the Yin & Yang meridians which are connected to the internal organs (Zangfu). One such aspect is to allow the breath to expand into the back muscles like the Lattissimus Dorsi muscle on either side of the back, when the student performs any of the Taiji Qigong exercise where the both arms are lifted together or in a singular method above the head the back muscles will come into play and with the intention of breathing deeply into the lungs like filling a balloon. As the Original Feng Shou Quan-Gongfu has its origins within Daoism, then it is obvious that this internal martial art (Neijiaquan) involves all of the Daoist symbolises to help give the practitioner a better understanding and knowledge on how best to skilfully use this internal martial art for both health, energy cultivation and self defence. The symbolism of the “Cloud Dragon and Wind Tiger” is just another repensentation of Yin & Yang, as the Cloud Dragon (Yun Long) represents the receptive or (Yin) energy and the Wind Tiger ( Feng Hu) represent the creative or (Yang) energy. And now the final mystery --- what was the book referred to? We get more secrets in the commentaries. therefore the full moon illustrates the symbolic "time" by which the collection of True Yang should happen. The symbolic "pound" of Elixir, therefore, is made of eight ounces of Lead and eight ounces of Mercury. Wow this is amazing that the Daoist alchemy texts now make sense to me!! and the lead and mercury claim I made above is corroborated - again the tricky part is realizing it refers to liver and lung energy!! 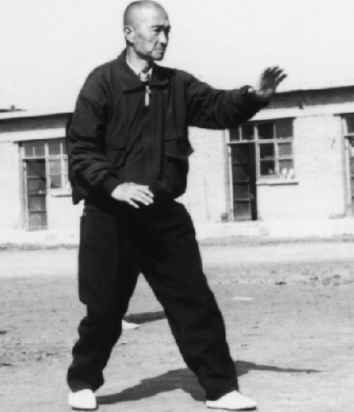 The Five Element Creation Fist routine begins as with most Xingyiquan routines in the Three Body Posture (San Ti Shi). The San Ti Shi is the most important and most basic training method in Xingyiquan. All movements in the style do not stray away from the principles of the San Ti Shi. The Santi posture is based on the metal element in the Xingyi five element fists. The metal element corresponds to the Lungs. Therefore by cultivating in this posture the Lungs and the Kong Chi are greatly enhanced. AMAZINGLY - there is no understanding that the right hand is yin while the lungs are yang - and this is the real secret of the San Ti Shi posture as the CORE training of Xingyiquan martial arts internal alchemy!!!! The left hand is yang while the liver green dragon is yin. This is just like licking a 9-volt battery. Last edited by voidisyinyang on Fri Mar 23, 2018 12:41 pm, edited 4 times in total. Fa Xing wrote: Oh lawd! So your avator has the hands the other way. Are you saying the hand position of right hand grabs tiger (lung) and left hand grabs dragon (liver) is just a coincidence? I was going from this link. There's seven photos of teachers - ALL with the left hand up and the right hand down - like in your photo. Plus the photo I posted from the dude who made the website has it the opposite way. right hand for males is yin while upper body is yang. left hand is yang while lower body (below navel) is yin . That's the alchemy secret of licking the 9-volt battery or connecting the yin-yang energy. Last edited by voidisyinyang on Fri Mar 23, 2018 6:24 pm, edited 1 time in total. Oh wow, not the 9 volt battery! Hey Rocky, yes Bullwinkle, watch me pull a rabbit out of my hat . Gee whiz and the entire time I was thinking that it was Professor plum in the library with the candlestick. Dagnabbit! Last edited by willie on Fri Mar 23, 2018 7:56 pm, edited 2 times in total. Isn't the main goals of alchemy to gain immortality and make gold from base metals ? And he mentions how anyone part of the Green Dragon Society - going back thousands of years - would be taught this secret of Tai Chi . - maintaining his virginity of both mind and body is the key secret of his alchemy qigong training, at 1 hr, 17-19 mns. So it's been proven that if a qigong master "discharges" qi energy it means that the stored up vagus nerve energy switches to the sympathetic nervous system. It’s unbelievable!” says Gerhard H. Eggetsberger, biochemist and technical head of the Institute for applied Biocybernetics and Feedback Research, in Vienna. So it appears that by crossing the sympathetic and parasympathetic nervous system it is like connecting the yin and yang of the battery of the body to build up energy. Last edited by voidisyinyang on Sat Mar 24, 2018 6:38 am, edited 1 time in total. The skeleton is oriented so that its skull points to the south. The interest in this discovery lies in the comparison with the astronomical diagram found in the tomb of Marquis Yi of Zeng (a minor state). It can be readily identified that in both cases the dragon lies in the east and the tiger in the west. Suzanne Cahill, an authority on Xi Wangmu, places her as one of several ancient “mu divinities” of the directions, “mothers” who are connected to the sun and moon, or to their paths through the heavens. She notes that the widespread tiger images on Shang bronze offerings vessels may have been associated with the western mu deity, an association of tiger and west that goes back to the neolithic. [Cahill, 12-13] The tomb art of this province shows the goddess of transcendence seated in majesty on a dragon and tiger throne. [Liu, 40-3] This magical pair goes back to the Banpo neolithic, circa 5000 BCE, where they flank a burial at Xishuipo, Henan. [Rawson, 244] Tiger and dragon represented yin and yang before the familiar Tai Ji symbol came into use during the middle ages. The dragon originated as the crocodile and the tiger and crocodile are used in Indian alchemy training as well and the crocodile is in Egyptian alchemy training.... so. There is a book called brain and bone marrow washing Qigong . The text was supposedly found in the walls of a temple in China. I read some of the book and it was so unbelievably outrageous that I just never picked it up and read it again. But for people who are into that sort of thing, well then that is the book. The book discusses how to create a Shen baby. The qi is transformed to Shen which is a energetic embryonic, duplicate of yourself which resides above your head in energetic form. The entire process of creating what they call the Shen baby takes 9 months to give birth. The energetic Shen baby which is a duplicate of yourself is supposedly sent out into the world after a period of I believe two years of acquiring your memories. So immortality really never had anything to do with your physical body aging and dying, it was more about creating an energetic duplicate of yourself. It all just sounds way too out there for me and is quite possibly a cult of some kind. Last edited by willie on Sat Mar 24, 2018 8:28 am, edited 2 times in total.